Courtesy of Reside Realty LLC. A rare combination of magnificent architecture, spectacular interior design renovated in 2015 by renowned architect, Ruard Veltman. The tasteful renovation reflects a sophisticated aesthetic that is both elegant and refined. This luxurious seven bedroom custom-built residence is set in a private gated community of Morrocroft on over an acre. Master suite features a separate his and her bathrooms and closets. The guest house has two bedrooms with private baths and laundry. New pool by B&B pools with outdoor fireplace and sport courts. 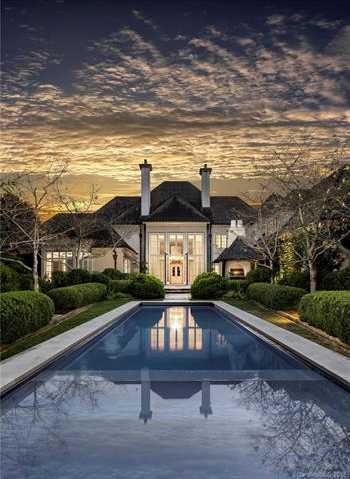 Enjoy a lifestyle without compare in this one-of-a-kind southern estate close to shopping, restaurants, and Charlotte Douglas International Airport, and Uptown Charlotte. Copyright 2019 – Carolina Multiple Listing Services, Inc.